I spent some time in the shop yesterday working on my plane making toolkit. 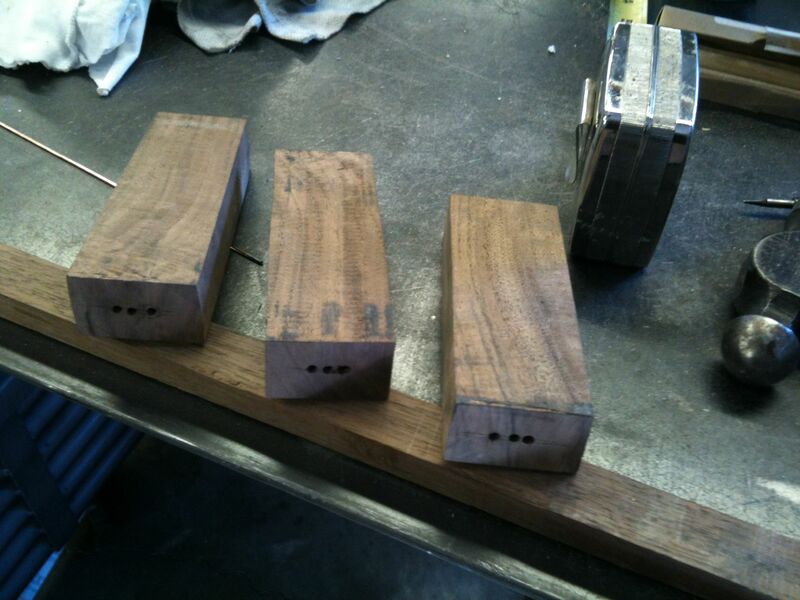 I’d previously profiled two float blanks and a matching chisel. I started with the side float, at the widest end – that way it’s all downhill from there right? I decided almost immediately that I couldn’t see what I was doing clearly enough, so I got out the red Dykem layout fluid again. I also used a hacksaw to start each tooth. The files I’m using are too small (4″ double extra slim triangular), and they are also not a great quality. They go dull too quickly, I used probably 8 files on just this one float. After adding the Dykem it was much easier to keep track of what I was doing. I would cut a few notches with the hacksaw, then file the tooth profile. I had to lift the file to work more on the far side of the wide teeth to keep them even from side-to-side, since the files were too small. 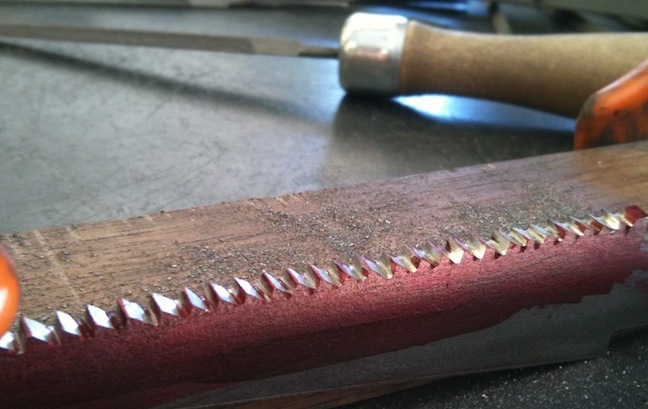 Like with filing teeth on a saw, the completed tooth should reach the center of any face of the file or it is using up the life of the next edge of the file. I didn’t bring each tooth to a sharp edge, I tried to leave a thin red flat at the top of each tooth. After I worked down the entire length of the side float I re-coated it with Dykem and reversed it end-for-end. I filed it again, still leaving the tiny flat at the top of each tooth, just to get the teeth as even as possible. I need to file the tip into one more tooth still, I missed that yesterday. The edge float went really fast, not surprisingly. First I transfered the layout of the teeth using a series of small hacksaw kerfs. You don’t need much of a kerf, I went a tad too deep on a couple. Now file in the teeth. Hold the file so the leading edge is vertical or even slightly undercut. As before I didn’t take the teeth to a sharp edge yet, I’ll do that after heat treating. The spacing isn’t perfect, but it’s more important that the tops of the teeth all be in the same plane. Using the tiny flats at the tip of each tooth assures that. I also thickness ground the chisel to .100″ thick, it didn’t take any time at all with the 50 grit belt. I sanded out most of the grind marks before heat treating. Heat treating involves two steps, hardening and tempering. I treated this the same as I would O1 tool steel. Bring it up to the critical temperature slowly, hold it for a bit and then quench it in oil. That gets the steel to it’s maximum hardness, but it’s also brittle. Tempering removes this at the expense of some of the hardness. I baked the parts for 1.5 hours at 500 degrees. Thanks to Kolya for his expert camera work! While the parts were baking in the oven (do clean off the oil residue first, unless you enjoy domestic angst) I started making some handle blanks. I had a scrap of Walnut that I cut into three blocks roughly 2″ wide by 4.5″ long. I squared the ends and drilled some 1/8″ holes to start excavating the cavity for the tangs. Once the parts are tempered, cleaned and sharpened I should be able to use them to clear out the waste. I’m enjoying the build. Keep it going. How did the heat treat come out? I’ve always treated 1095 as w1 and quenched in water, then for something like that draw the temper out to cobalt blue. I’m not sure what the temperature actually is there but it’s probably around that 500 mark. The heat treat is good. I checked them after quenching, and they were certainly hard – a used file just skates across the surface. After tempering they are file-able again. I’m not totally happy with the filing job on the face float (cosmetically), but it works well.